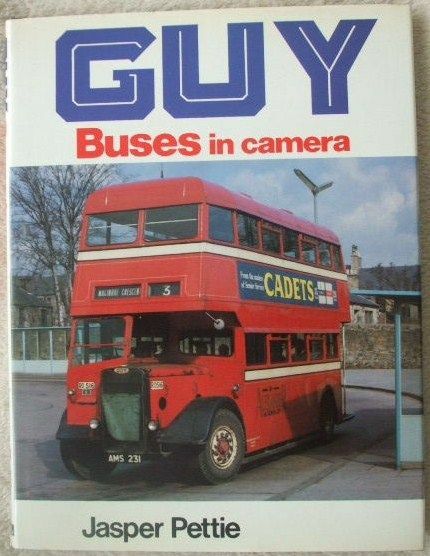 First edition, first print hardback of GUY BUSES IN CAMERA by Jasper Pettie and published by Ian Allan Ltd., in 1979. The book is in very good condition (Clean black cloth boards with gilt lettering on spine), with only minor wear to the pictorial dust jacket which is not price clipped. Internally, the pages are clean and tight and there are no tears and no inscriptions. "The early years of the 20th century up to the start of World War I were years of intensive development in the motor industry as the techniques of manifacturing and operating the new internal combustion engine began to be perfected. By the end of the first decade the motor car had become firmly established as a serious means of transport rather than a sophisticated toy, its protagonists could look to the future confident that expansion and development would be a certainty. Not so the bus, or indeed the application of the internal combustion engine for heavy commercial use. Motive power for heavy road haulage work was either horse or steam and both were stolidly reliable, whereas the purchase of a purpose-built bus in 1914 was difficult for an operator - most were modified freight chassis - and much development work in terms of reliability and passenger comfort was required. It was precisely at this moment of economic potential that Sydney Guy stepped in to found his empire, an empire which was to encompass buses and trolleybuses and, of course, freight vehicles and would eventually be the doyen of the heavy end of the road manufacturing industry. With pictorial coverage of a very representative selection of old and modern Guy passenger vehicles, both at home and overseas, Guy Buses in Camera provides a fascinating visual record of this famous manufacturer that will stimulate both historian and enthusiast alike." Contents include: Introduction; The Early Years; Arabs, Wolves and Vixens; Postwar Developments; Arab Fours and Underfloors; Warriors and Wulfrunians; Final Consolidation to Date; Bibliography." 112 glossy pages. Illustrated with black and white photographs.